My Italian grandmother is 99 years old and still loves to cook. Even though my dad has grandchildren of his own, every year my grandma dutifully packs up a box full of tins of her cookies and ships them to him. She makes her famous pepper biscuits and wine cookies, almond bars (biscotti without the double baking), frosted bells and stars, her lebkuchen (I still don’t know how those entered her repertoire) and most importantly her pizzelles. 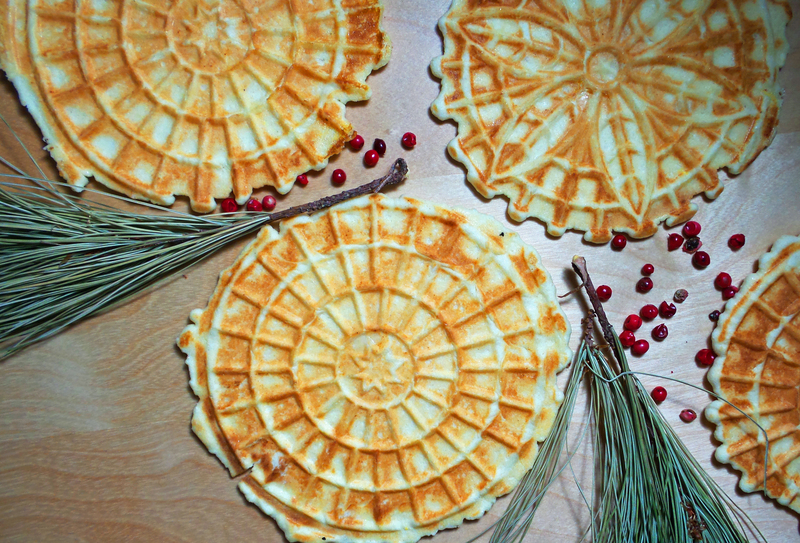 The appearance of pizzelles means that the holidays are finally here. Addictive, the sweet waffle cookie is thin and crisp, flavored with a hint of anise (and yes, it isn’t a pizzelle to me if it doesn’t have anise in it). Traditionally, these sweets were made by heating a special iron over the stove and pouring the batter in–technology has considerably improved the process, nowadays you can buy an electric pizzelle iron for very little money. This is the one piece of equipment in my kitchen that has a single, particular use and the pantry space it takes up is totally worth it. I love curling up with a couple of pizzelles and a cup of coffee in the morning during the holidays. It reminds me of my grandma (who no longer makes the trip down to spend the holidays with us, the car ride is a bit too long). We would sit together and have breakfast, she pouring her cup of black coffee over her cheerios and eating the whole mess with a spoon (I still don’t understand this particular morning ritual) and me doing my best to mimic it with her cookies and some coffee–the one time of year I would eat dessert for breakfast. And, yes, while most of the recipes featured here are special-diet-friendly, these cookies are decidedly not. I can’t mess with my grandmother’s pizzelle recipe, it would be tantamount to treason. For the Pizzelles: Grease the pizzelle iron with corn oil and plug it in. In a bowl cream together the eggs and the sugar. Add the butter and whisk until well combined. Add the anise extract. Sift together the baking powder and flour and slowly add the dry ingredients to the egg mixture, whisking until well combined. Place a heaping spoon of the batter in the center of the pizzelle maker, close for approximately 2 minutes or until the cookies are a golden color. Remove from the iron and repeat until you have used up all of the batter. Note: Allow the pizzelles to fully cool before you put them in a tin or stack them on top of each other. The cookies are meant to be thin and crispy and the moisture from the heat will soften them up. This entry was posted in Dessert and tagged christmas, cookie, dessert, New Years, Pizelle, vegetarian. Bookmark the permalink. As much as the memories, I love the gentle anise cookie flavor of those pizzelles and the light, soft crunchy texture. It’s so great you are carrying on the tradition.